Erin Arts Centre, Isle of Man - Frazer Hines - 50 Years in Showbiz - Anniversary Tour/ Sat 30th Novemeber 2010. The show starts at 8pm and consists of a two part performance. Part one will see Frazer talking about his life and experiences over the 50 years that he has been in showbusiness. Following a 20 min interval Frazer will return to the stage with Sam Stone - who will interview him in a Q & A which will be interspersed with questions from the audience. Waterstones - Llandudno/ 6th November 2010. Meet Sam Stone & Frazer Hines in the busy centre of Llandudno. Copies of all the Vampire Gene Series will be available to purchase. 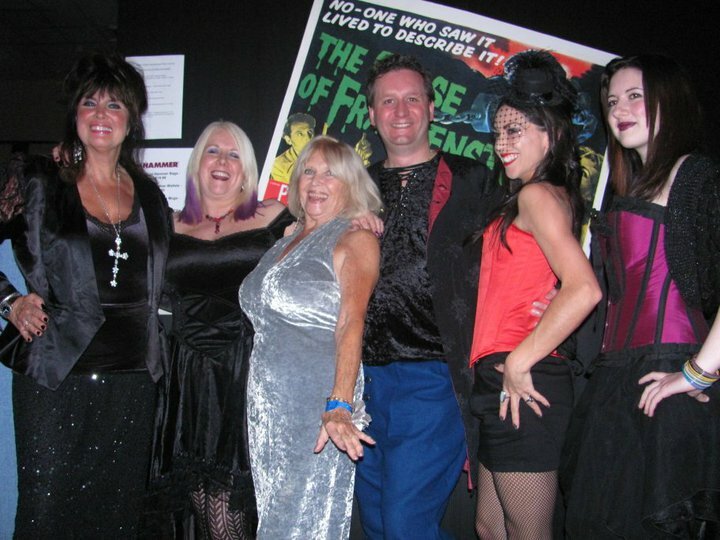 The Scala, Prestatyn, North Wales - Frazer Hines - 50 Years in Showbiz - Anniversary Tour. The show starts at 7.30pm and consists of a two part performance. Part one will see Frazer talking about his life and experiences over the 50 years that he has been in showbusiness. Following a 20 min interval Frazer will return to the stage with Sam Stone - who will interview him in a Q & A interspersed with questions from the audience. Join Sam Stone with Actor Frazer Hines signing copies of their books at this popular Waterstones store. 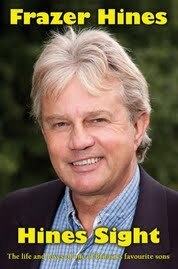 The Swan Theatre, Yeovil - Frazer Hines - 50 Years in Showbiz - Anniversary Tour. Address: Swan Theatre, 138 Park St, Yeovil BA20 1QT. Waterstone - Truro/14th November 2010. Journeying further to the coast Sam Stone and Frazer Hines will be at this Waterstones stone. Meet Sam Stone, Frazer Hines & Horror Writer Andy Remic at this in quaint award winning independent bookstore. The Lass O'Gowrie, Manchester - Frazer Hines - 50 Years in Showbiz - Anniversary Tour. 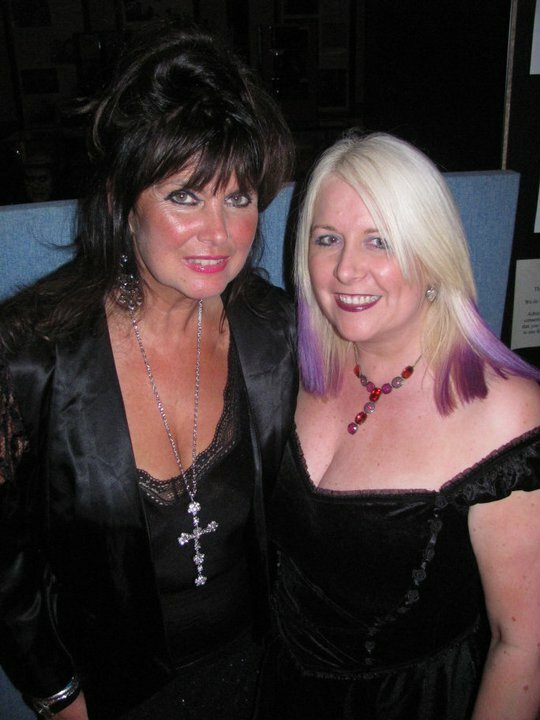 Caroline Munro - looking gorgeous. 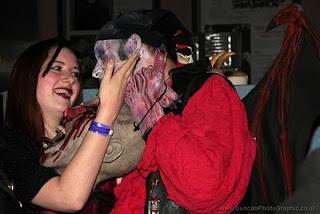 As you know my usual haunts usually consist of Literary or Doctor Who Conventions however this weekend I attended the Bram Stoker Film Festival, which took place in the beautiful seaside resort of Whitby. 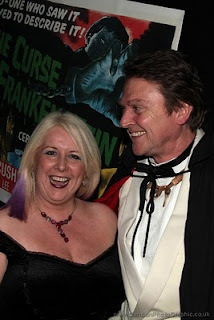 I'm a huge fan of Dracula by Bram Stoker - naturally - and of Hammer movies so it was great to be invited along to participate in this marvellous convention. The fun kicked off on the 14th October and consisted of guest interviews, panels and horror movies playing to an ongoing schedule. 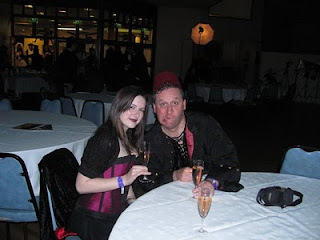 On Saturday evening there was the Vampire Ball. 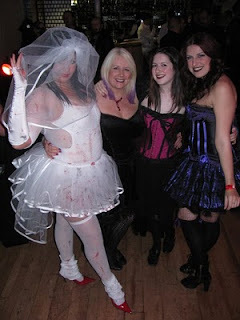 A great opportunity to dress up and dance, drink, chat and generally have a good time. Other guests were Caroline Munro, Martine Beswick, Vera Day, Emily Booth and Shane Briant. Here's some other pictures of the things we got up to at The Vampire Ball. Linzi and the new love of her life!! Yes - we were having lots of fun! 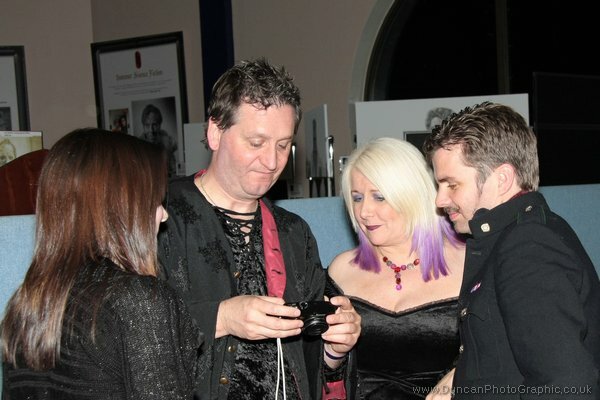 Linzi and David - and this was only the beginning of the night! You can now read part three of my mystery - Lead Poisoning - at Book Chick City. 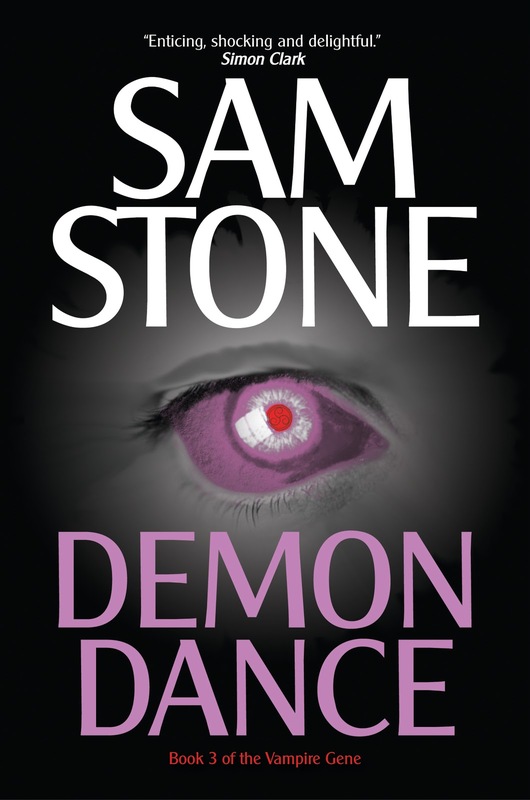 Sam Stone Appearances 15th Oct - 20th November. 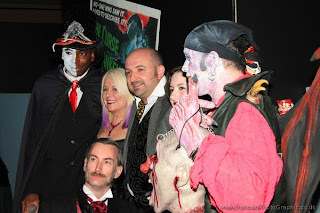 Bram Stoker Film Festival - Whitby. 14th-17th October 2010. David J Howe & Sam Stone will be attending this event and appearing as a panellists. 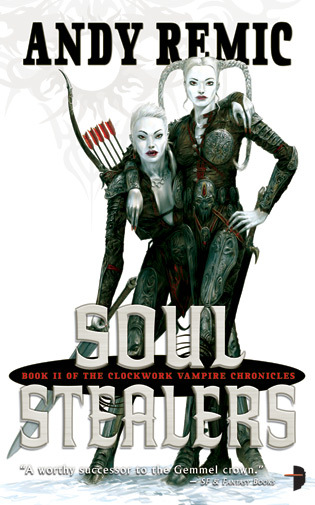 The Vampire Gene Series and a collection of Telos Publishing books will be available to purchase. APPEARANCE DATES: Saturday 16th October - Sunday 17th October. Sam Stone will be in the LRC at Yale College, Grove Park Campus, Grove Park Road, Wrexham. LL12 7A. Meet Sam Stone & Frazer Hines at this in quaint award winning independent bookstore. Book Chick City have now posted Part 2 of my four part serialised story 'Lead Poisoning'. The link for Part 1 is as seen below. You now have a chance to read my new story 'Lead Poisoning' in 4 parts at Book Chick City. Click the link to read part one now!